I have known Sarah Willes for at least thirty years, since she started Blues as a catering business, from her house in Fulham, and it has now become one of the important agencies supplying experienced Chefs to large banks and City institutions, successful companies, and the professions, as well as private chefs to high net worth individuals, who live an international lifestyle. However, as the title says, the recipes which we are reproducing from this new book, are for ‘relaxed family holidays’, from Skiing holidays in the Alps, to beach holidays in Cornwall, so we hope you will enjoy them as much as we do. For the next few months, we will be reproducing a selection of the best recipes from this book, and if you would like to obtain a copy, subscribers to The Vintage Magazine can buy it direct from Blues Agency www.bluesagency.co.uk at the special price of £12 (twelve pounds) each, to include postage and packing. This dip also goes really well with barbequed lamb. Roast the whole aubergines on a baking tray for 45 minutes, until the skin is wrinkled and the flesh is completely soft and coming away from the skin. Put the aubergines in a bowl and cover with cling film. Leave to cool slightly. Take the aubergines out, peel the skin off and place in a food processor with the feta. Whizz until smooth, then slowly add the olive oil, followed by the salt and pepper and a squeeze of lemon. 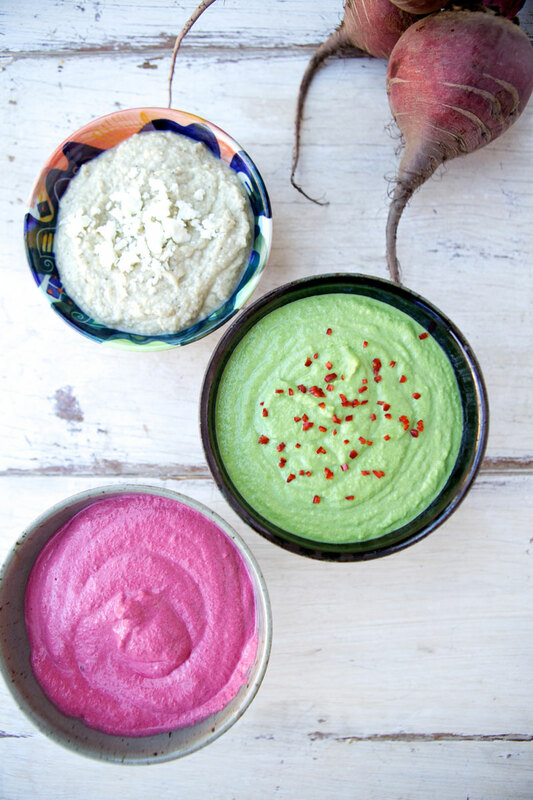 Put the beetroot, cream cheese, horseradish sauce and lemon juice into a food processor, or use a hand held blender. Blend up the ingredients until as smooth as possible. Season with salt and pepper to taste, and add a little more lemon juice if desired. Decant into a bowl and place in the fridge. Scatter over toasted flaked almonds if you like, and serve with toasted pitta bread and carrot sticks. Fresh tasting and unusual – perfect with cheese biscuits. Cook the peas in boiling water for 2 to 3 minutes, and drain. Add the peas, crème fraiche, cream cheese and wasabi paste to a food processor or use a hand held blender. Blend the ingredients together until smooth. Taste and season with sea salt. Spoon the dip into a bowl, mix in the chopped chilli and refrigerate until needed. Another vibrant recipe taken from Darina Allen’s book Easy Entertaining. This frittata is seriously colourful and inviting. Whisk the eggs together in a large bowl. Add the chopped herbs, chorizo and the parmesan cheese, and stir it all together thoroughly. Add the tomatoes, cutting any particularly large ones in half, and stir gently. Season the mixture well with salt and pepper. Add the butter to a large non-stick frying pan. When it starts to gently bubble, add the egg mixture to the pan, and turn the heat right down. Cut the goats cheese into walnut size chunks, and scatter them over the top of the egg mixture. Cook the frittata extremely slowly for around 15 minutes – the underneath should start to set, but you do not want it to burn. When the bottom is set and the top is still runny, turn the grill on to a medium to low heat. Place the frying pan under the grill and cook for a few minutes, until the egg has fully set and the surface is very slightly browned. 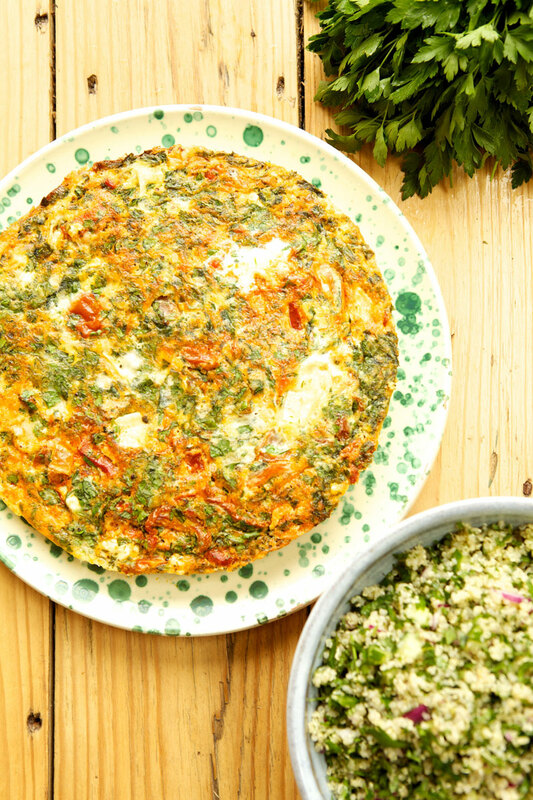 When the frittata is cooked, slide it on to a plate, and serve it warm with a large green salad. Tabbouleh, but just a little bit different. Boil the quinoa in enough stock or water to well cover it for 20 to 25 minutes until just cooked. Drain and tip into a large mixing bowl. Juice the lemons and pour the juice over the warm quinoa, add the olive oil and mix well. Half the cucumber lengthways and scoop out the seeds with a teaspoon, then chop the cucumber into cubes. Add it to the quinoa along with the chopped onions. Chop the parsley and mint, either by hand or in a food processor, and stir into the quinoa, and season to taste with salt and pepper.